You know, last month I mentioned the apparent modulation the local rock music scene is undergoing — but I didn’t even touch all the bases. It’s not just the venues that are opening or closing: the loss of Day for Night is probably not causing anybody to sport a black armband, nor does the opening of the Bone seem to be generating cartwheels of felicity. But the bands themselves are widening the scope of their horizons. M-99 recently played a show at Eats Ave. Tav, of all places. 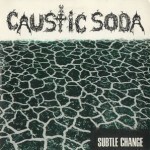 And Caustic Soda and the Oily Bloodmen are slotted to do an acoustic gig at Mark’s Hawthorne Pub, while the Dharma Bums and the Posies from Seattle are slated to do the same at Belmonts. Such a spirit of exploration can only bode well for the bands brave enough to follow. For, it is that spirit which allows a band to grow and mature. 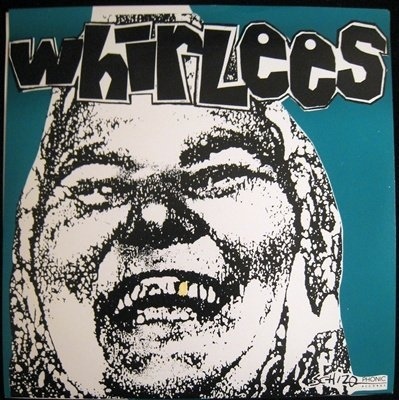 Salem’s Whirlees have slowly carved a name for themselves in the past five years or so. And no wonder. Their raw, raucous rock is as contagious as the ﬂu and about as easy to get out of your system. Kicking of with a rousing, ragged guitar riff, “In My Groove” features the raunchy growl of vocalist Vaughn Berger. Berger alternately sounds like Mick Jagger, Jim Morrison and John Kay of Steppenwolf. Guitarist Scot Hofstetter, the latest addition to the band, artfully guides the rhythm section (with the aid of ex-Whirlees lead guitarist Peter Frajola) through a rugged exercise in grunge. “Cuban Rebel Girl” reminds of the Ramones in their prime, but this band is composed of more able musicians, though perhaps not as cynical. The Whirlees have shown development musically, becoming tighter and more cohesive with each new release. While this is a limited edition single of a mere 750 copies (on purple vinyl!) a full-length recording is due out this summer, so stay tuned. Though February is supposed to be the month for couples, musically speaking anyway, it would seem to be the month for singles—seeing as how there here for review this month. This green vinyl three-song release fairly smolders with emotion and passion. Lead vocalist Rene follows in the gasoline voiced tradition of Monica Nelson and Heidi Hellbender on the title song — thrashing her way through two and a half minutes of angst driven perdition. Guitarist Regina La Rocca (who provides the ties to both the Obituaries and M-99) churns out a twisted ﬁligree, before lurching into the familiar half step modulations that serve to denote the doomy territory this song, inhabits. “Smoking Mirrors” goes in a different direction, slower and more melodic with overdriven riff provided by LaRocca. This song provides a nice departure from the gutteral wailing of the first number. “Strychnine to the Earth” is darker in texture, free form poetry delivered over gothic grunge—propelled by Curt Schulz’s machine-gun fire drums. This is a faithful rerecording, Definitely live in the studio with a minimum of studio magic. Raw, pained and incendiary, Subtle Change stands as a monumental testament to unhappiness. This three-song EP was reviewed in its demo form several months ago but is included here because (A) It is now a ﬁnished, marketable piece of product, (B), It’s my damn column, and (C) the recording is being released on the Rainforest label, the most recent addition to the stable of Portland area record labels. Based out of Wilsonville, Rainforest Records is headed by California transplant Ray Woods. Woods released several tapes and CD’s on Rainforest while located in California. 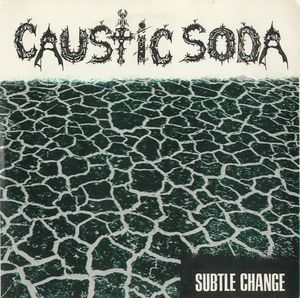 The Young Turks is the first (of several, including Caustic Soda’s EP) to be released by Rainforest from its Wilsonville locale. 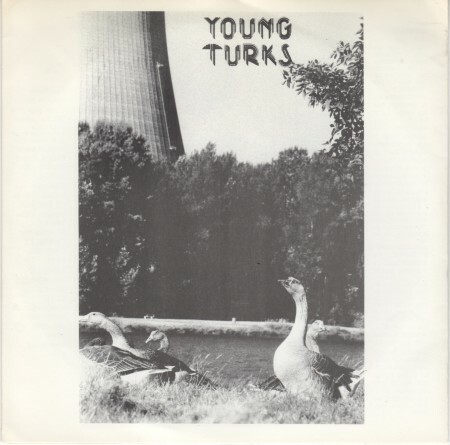 Young Turks is the work of the gifted Billy Snow and his curious 9-string guitar. “Devils Child” is a hard-driving number with a rolling bass and nasally Lennon-like vocals by Snow. “Fruit of the Fever” maintains the feel of the first cut — scurrying and spinning in a jangled frenzy. “Restless Son” is a bluesy ballad with balls, and a deep sense of desperation. Snow alternates the chiming aspects of the deeper strings of his guitar with a snaky slide figure on the high strings. The choice of roster and the quality of product released by Woods and Rainforest is to be commended. Support and encouragement is due him. Both the Turks’ and Acoustic Soda’s recordings are deserving of merit—and acquisition. This recording is notable, if for no other reason than it marks the return of Jennifer Floro to the scene. 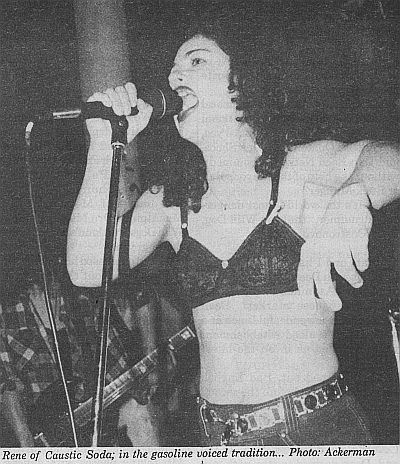 Followers of the early underground scene will remember her as the beautiful and talented vocalist in Jenny and the Jeans. The Jeans were a very popular act in the early 80’s, but are most auspiciously remembered as being the band that was playing the night some moron unloaded several guns into the crowd at Salem’s Museum tavern. While none in the band were hurt that night, Jenny never seemed to fully recover from the emotional trauma of that tragic and infamous night. And while she only makes an occasionally back-up appearance on this recording, it’s good to see that she’s still singing. That’s one person who should be. This recording is a mostly good timey in feel, well captured and executed. Hansen is a good keyboardist and a competent songwriter. His vocals, while slightly reminiscent of Randy Newman, lack the distinctiveness to be termed memorable. But they are user friendly and warm. His back-up band is very good. Mike Andrews is quite effective in the guitar role, subtle and unpresupposing: as is the drummer, Terry Peddicord. And sax man Scott Franklin turns in many sterling performances. And another appearance by one of the formative contributors to the local scene of the early 80’s—this time Bruce Shera, who was the drummer in one of Portland’s truly great undiscovered bands: eccentric. eccentric was never able to acquire the crowd they deserved, due in part to their unremitting complexity and unyielding intelligence. Bruce plays all the instruments here. While always a great Copeland-like drummer, he proves himself to be a clever keymeister and a decent guitarist, certainly capable enough to make his points succinctly. “We’re Your Parents” reflects influences such as the pre-Crowded House Split Enz and Peter Gabriel while adhering to a bizarre 1-4-5 chord progression that hearkens morbidly toward Chuck Berry. Le Nouvel Anglais is a thoughtful and well-recorded piece of work. The same pre-emptive tendencies in eccentric are certainly evident here. Rampant intellectuality and a philosophic predisposition will be an offput to the headbang contingent, but everything puts them off—that’s why they bang they head. But for those of you in the realm who do your thinking for yourselves, who occasionally posit some kernel of a philosophical dialectic, why you might find this to be a delightful concoction. Pop Theology is the new band assembled by ex-Napoleon’s Mistress figures, Robert Noel And Gina Behrman. To that familiar blend the pair have added Jonathan Drechsler, the original bassist for Nu Shooz, and Mike Dion, late of Walkin’ After Midnight, lead guitar; and Brian Denn on drums. What we have here is music that is similar in scope to that of the Mistress thing, with perhaps, a more acoustic edge to the arrangements and a little less melodrama. Robert Noel sings more frequently with this band—in a style comparable to Richard Butler of Psychedelic Furs. Robert sings lead on “Saturday Night,” a jaunty tune, nicely complimented by occasionally 3-part harmony. 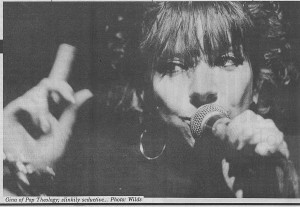 “Every Time” features Gina on vox—a slinkily seductive number, perhaps faintly reminiscent in feel to something the Pretenders might release. “In the Field” is a pretty piece, featuring Gina in the lead. Certain turnarounds in this tune remind one of the girl-group sound of the ‘50s and ‘60s. “Deep Ends” is slightly country in feel. Slap-happy trap set rails like a train down the tracks. Both Robert and Gina have made definitive changes in their individual writing and singing styles to accommodate this new line-up. Gone are the occasional histrionics that sometimes weighed the Mistress down. Robert’s voice, especially, shows marked improvement. Gina simply seems more relaxed. I don’t hear the hit single here that would propel this band to where it would like to be. But what is here is well written, tuneful and thoughtful. And there is every reason to believe that a hit single lurks within this unit somewhere. Concentration on more memorable choruses should do the trick. Well, that and time. This band is tighter than the Voodoo Dolls, owing primarily to “guitarmeister’s” chunky riffing. “Little Bit More” features a funky feel as if the Stones were to meet, like, Hot Chocolate or something. Roland proves he is a capable guitarist, especially in putting together support riffs. His solos aren’t exactly riveting, but he’s a good player. Drummer, Lenny “the Ripper,” shows some extensive chops holding down the beat with the dead bass players. “Winter Song” is a nice departure — moving toward balladic and away from bombastic. Kind of a surprising development. And “Uptown Crazee” sort of falls somewhere between the previous two tracks—stylistically anyway. Agent X35 are hard to categorize. I was expecting something thrashy, which this recording is not. Mellow is not the word either, mind you, but somewhere between those two extremes would be where this band could be found. By the way, Agent X35 is looking for a bass player. The two dead ones are not doing a very good job of showing up for rehearsal. If you’re a bass player who is alive, I’d say you have a leg up on the predecessors. Oingo Boingo performed: 12/29/82 @ Euphoria; Starry Nights on: 11/6/85, 10/16/86, 2/9/88 and lastly at Roseland Theater on 7/12/94. Thank you!